Triphaladi Guggulu is an Ayurvedic preparation composed of a simple formula of only a few common yet powerful herbs to make tablets. The preparation process (that I employ) on the other hand involves extensive, intricate and labour intensive procedures. Note that this preparation process (illustrated below) is rarely practiced by herbal manufactures and herbalists. The methods performed involve high amounts of attention, monitoring and flow of consciousness. 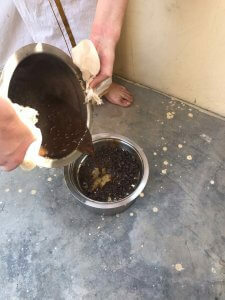 I was instructed to prepare Triphaladi Guggulu this way by my teachers during my Dhanvantri Diksha (initation), as a preface into the field of herbal preparations (Aushadhi Vijnana). Most of the knowledge about the purification of herbs have been lost. 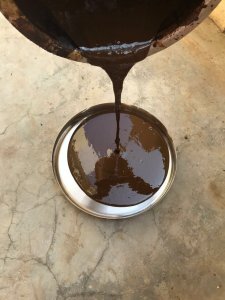 Vital Veda employs purification and preparation methods that has been passed down for many generations within the Raju Family of Vaidyas. This ensures safety and enhances potency, and is one of the factors that make our herbal products profoundly effective and treasured by so many. This method of preparation is by superior and immensely enhances the potency and efficacy of this herbal formulation. "What Dylan made is worth more than diamonds." By enkindling fat metabolism (meda agni) thus clearing out ama from the adipose channels (medavaha srotas). This prevents or reverses stagnated fat tissue, causing cravings and false hunger. Strengthens the whole system by removing the causes that turn accumulate into pathogens. Combats allergies, repetitive colds, boils and infections in kapha types by strengthening agni and clearing mucus toxins. It has an action of removing obstructions in channels (Srotorodhaghna) such as excess kapha from the plasma, chest and lungs creating asthma, bronchitis and phlegmy cough. Also for sinus congestion, nasal drip and rhinitis. 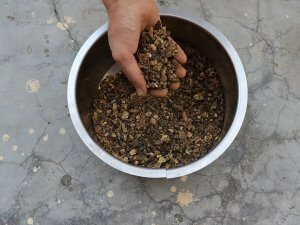 Scrapes toxins (lakhana) such as ama and kapha in the GIT tract causing poor digestion and low metabolism. Helps in constipation by correcting the flow of apana vata downwards in the digestive tract. Also helps in fistula (Bhagandara) and haemorrhoids by purifying the blood and regulating the flow and direction of vata. Also helps correct low tissue metabolism (dhatu agni) which clears obstructed channels (Srotorodhaghna). It's hot and dry qualities treats rheumatoid and osteoarthritis that is aggravated by cold, wet, damp conditions when vata and ama have accumulated. It has a specific action on sleshaka kapha and the synovial fluid in the joints with its scraping action (lekhana). This preparation took me over 350 hours across 41 days to produce approximately 1200 triphaldi guggulu tablets. Additionally, a small fraction of this I had a little help from my colleagues, which ended up being a big help. Special mantras (primordial sounds) are chanted throughout this whole process to infuse vibrations into the highly receptive particles in the plant substances. 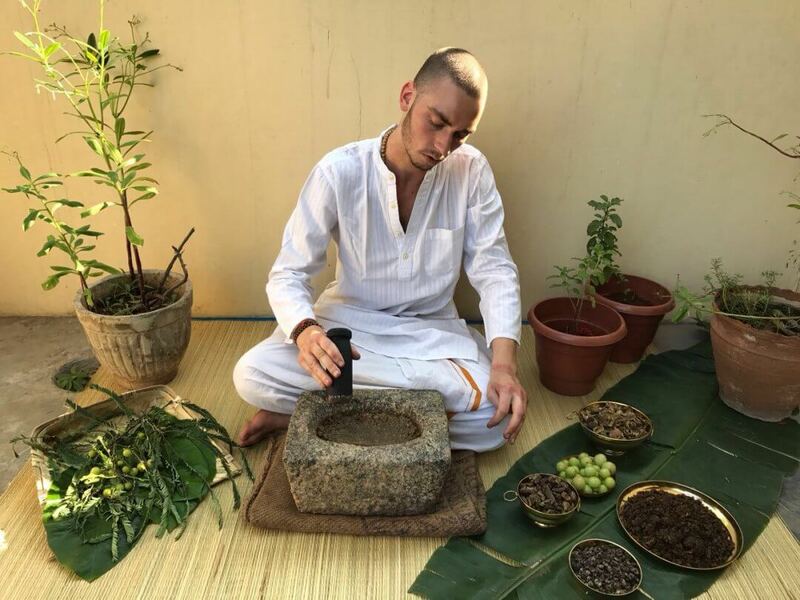 This preparation method is traditionally the first herbal preparation a student of Ayurveda and Ayurvedic herbal should prepare. It is appropriate for devoted and physically and mentally strong students. It is not for the faint hearted, nor for the impatient. Triphala cleans the bowels, ama and regulates the flow of apana vata (downward movement in the body). Use the whole fruits dried. Guggulu scrapes the channels and clears ama out of the system. Specifically works on meda dhatu (fat tissue) and is an anti-inflammatory. There are 5 types of guggulu. You want the Hiranya type that is commonly used for medicine. This is like gold in colour (Kanaka). Guggulu is an oily latex/gum/resin exuded from a small tree. Use it in raw resin form. Fill a large mortar and pestle up just below the rim of the bowl (mortar) with raw guggulu resin. Pound it 100, 000 (one hundred thousand) times. Every 10 minutes (approx. ), scoop up the squashed guggulu, loosen it up, turn the guggulu inside the mortar and start another round of banging. This is also a break time to rest your arms (see video). Keeping the guggulu in the sun, while banging it or not, helps soften it and makes it easier to bang. 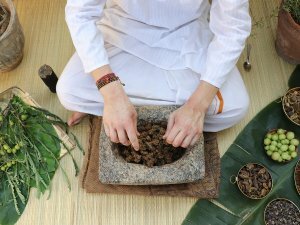 Chanting mantras while doing it not only enhances the herbs, but also is a tool for counting. For example, I perform minimum 8 bangs per the mantra I use. I chant the mantra 108 times in a row (1 mala), and keep track of how many malas I do. So 1 malas = 108x8 bangs. If banging with my left hand, I count the mantras in my right hand using a beaded mala (necklace with 108 beads). If banging with my right hand, I count the mantras on my left phalanxes. Obtain mantra from your guru or contact me to perform a Dhanvantri Diskha and learn this procedure in person with me in India. This will take days. It took me 6 days of basically full time banging (kutanam). Switch hands when you get tired. I switched about every 1-2 malas. This is one of the more laborious steps. It is only for the strong (especially strong triceps, forearms and tough hands). 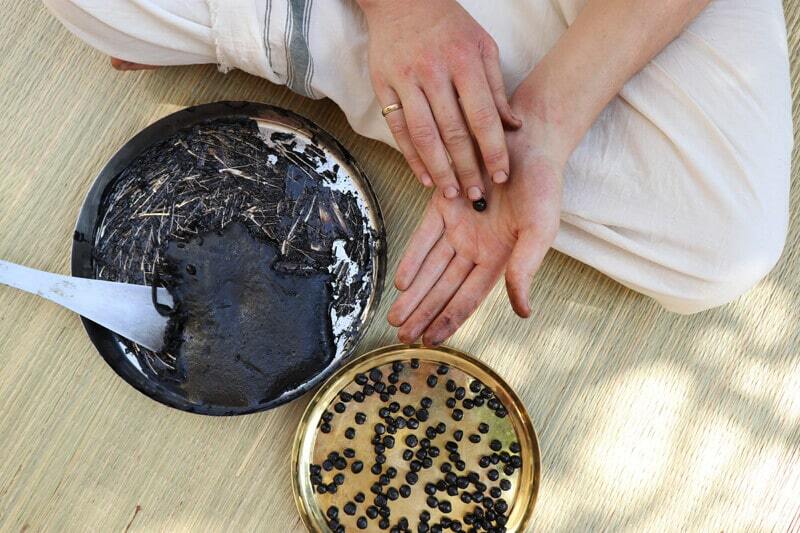 Keep the guggulu inside the mortar and pestle with a lid covered when not in use to protect from dust. Such as overnight. 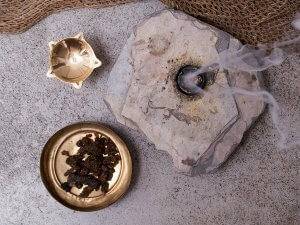 This is a very powerful purification method for guggulu that is hardly practiced. Hand banged is way more effective to enhance potency than using machines. 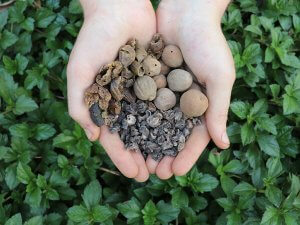 Take 1kg of raw dried triphala fruits (equal parts of the 3 fruits). Grind or bang lightly to a coarse consistency (pictured). You can use food processor for this. Boil 1L of the coarse triphala in 10L of water and reduce to half (5L). Strain and you have a decoction. 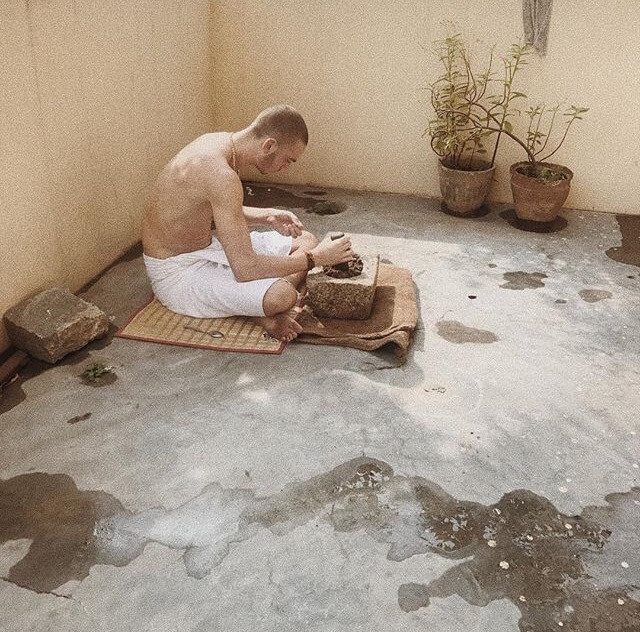 The coarse triphala holds a lot of water, so squeeze it out inside a muslin cloth to get as much as possible. Keep the coarse triphala for other uses. 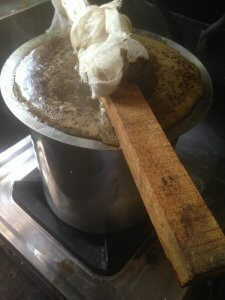 Tie the guggulu in a bolus with a thin material such as a muslin cloth. I ended up with about 700 grams. Fully submerge the bolus in the pot but don't let it touch the bottom because that will burn it. Boil on high heat. Be careful so that it doesn't bubble over. The guggulu will exude out of the bolus, into the kashayam. The kashaym will eventually evaporate and you will be left with a slimy like tar substance. 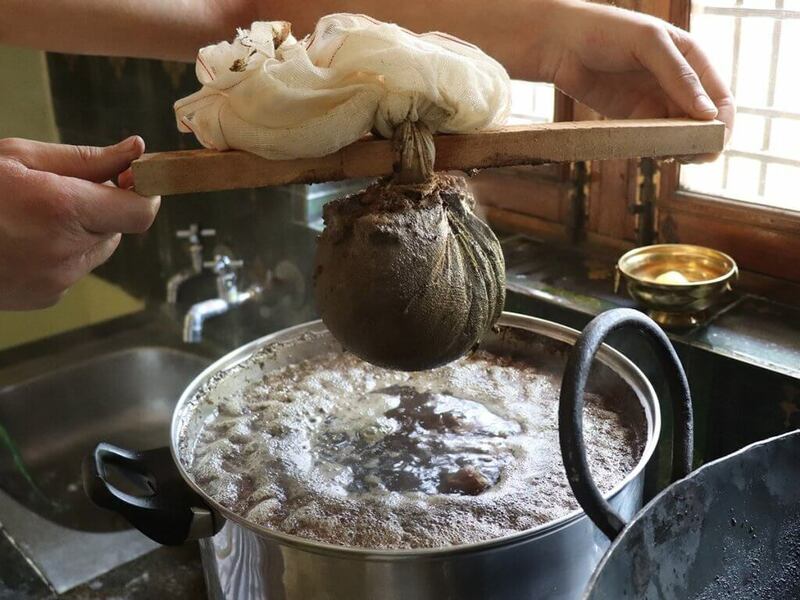 You will probably need to keep transferring this process into a smaller pot, 2-3 times, as you will need a smaller pot so that the bolus is submerged as much as possible. Continue this process till the guggulu fully exits the muslin cloth. This can take up to 20 pots for the amount of Guggulu I used (700gm), so perhaps use less. When the matter in the pot is thick, vicious and seems the kashayam / water content has been mostly evaporated (as much as possible), pour it onto a clean plate. You want it to be on a large plate and multiple plates so that it is a thin layer so that it dries quicker. Cover the plate with a clean glass (ideal) or a tight clean cotton cloth, then leave in the sun to dry up the remaining water content and harden. The cover is to prevent dust from coming in. If using cotton ensure it does not touch the paste. Keep the paste very clean. Take it inside at night time to avoid moon (water) exposure. Drying time can range from 1 week to 4 weeks depending on how thick the paste is and the climate. Drying is finished when the paste is hard but you can still squish it if you push hard. It shouldn't be to hard so that you can still manipulate the paste to roll into tablets. This step is a little challenging and laborious. Using a knife or sharp scraper, scrape some paste off the plate. Collect the right amount of paste to then roll into one spherical tablet. Put back on a plate for potentially more drying if it is to sticky and water content is not fully removed. When ready, package in containers! If the paste is to sticky to work with, add some triphala powder and bang with the paste. I made large tablets (vati), therefore I prescribe 1 tablet 2x/day before meals. Vital Veda's precious Triphaladi Guggulu Vati is available for people and for those who really need it.